Enjoy the outdoors. Be active. Create everlasting memories. With so much to do and see, you’ll love living in The Trails neighborhood at Shearwater, where MasterCraft Builder Group is offering their beautiful Spoonbill design. 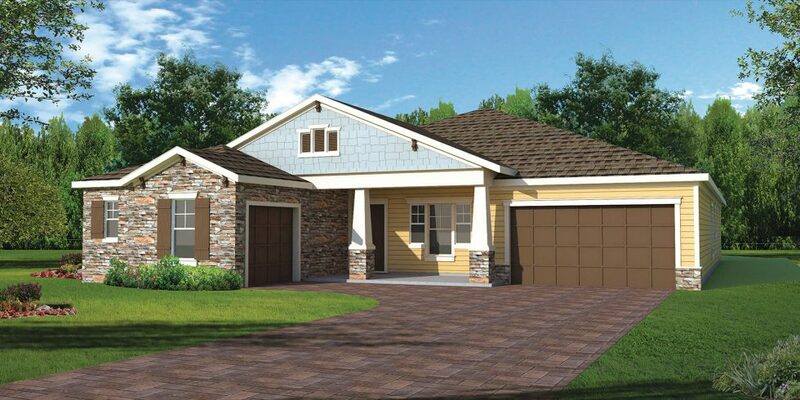 The Spoonbill is a charming one-story plan that includes four bedrooms and three bathrooms across an expansive 3,184 square feet. This home offers inviting gathering areas to bring everyone together, yet provides enough space for each member of the family to spread out in a room of their own. The Spoonbill design is ideal for entertaining, with a great room, bonus room and covered backyard lanai—making it the perfect place to enjoy the company of friends, family, and life at Shearwater. Sip your morning coffee while reading the newspaper, or relax with the family for an evening on the spacious front porch—which is large enough for a swing, rocking chairs or your favorite hammock. The centerpiece of this home is an impressive kitchen that overlooks the great room, providing a seamless transition from supervising children at play to entertaining dinner guests, with features that will delight even the most discerning chefs. What’s more, a pocket office—otherwise known as “Mom’s Command Center”—next to the kitchen provides an ideal space to organize family schedules, grocery lists, homework help, and much more. The family foyer next to the garage entry is the perfect ‘stop and drop’ catch-all for mail, purses, backpacks and sports gear, featuring multiple USB charging stations for all of your family’s electronic devices. The 3-car, split garage allows you to park in one spot and use the other to store everything from bicycles and kayaks to golf carts and more. The Spoonbill plan offers endless customization options, including a study, extended bonus room, or multi-generational suite. The Spoonbill is one of many distinctive new home designs offered by MasterCraft Builder Group within The Trails neighborhood at Shearwater, which range in size from 2,987 to 4,071 square feet with both one- and two-story floor plans available. The Trails features large home sites that back to a nature preserve and/or a picturesque lake. All MasterCraft homes come with top-of-the-line finishes and multiple opportunities to tailor your home, your way. Prices start in the low $400s.